In the regions of India's great rivers, the Indus and Ganges, the Kshatriya Hindu caste of rulers and warriors is largely composed of the Rajputs. This network of warrior clans, forming many kingdoms, was successful in preventing the Muslim empires from expanding past the Indus River for many centuries, but the Rajputs fought each other as much as foreign invaders, and eventually Turkic conquerors were successful in creating strong sultanates that typically ruled from the magnificent city of Delhi. By the time of the reign of the Tughluq empire, the Rajput realms were largely subjugated to the glory of Islam, with Rajput rulers serving as sworn vassals of Delhi, and Rajput warrirors conquering the enemies of Delhi. 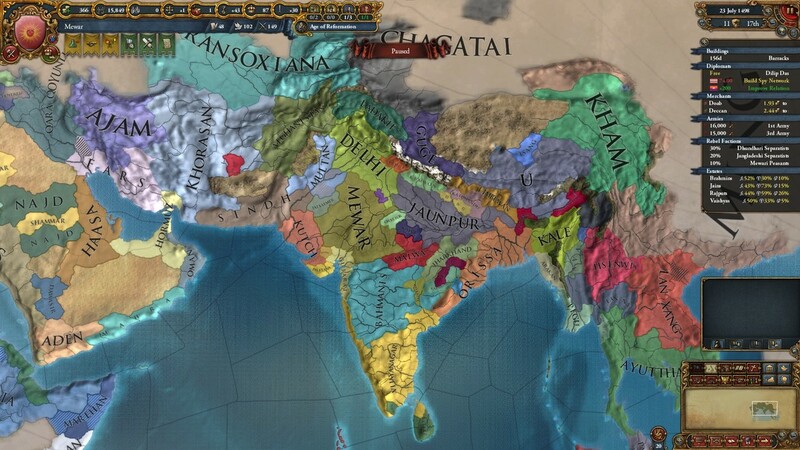 This all changed when Timur the Lame crushed the Tughluq armies and sacked Delhi. Within a short span, Tughluq rule had disappeared, and though the Sayyids claimed to inherit their authority and power, the vassals of Delhi seized the opportunity to carve their own paths. For Maharana Kumbha Sisodiya of Mewar, this is a time of revival for his kingdom. The Mewari have stubbornly clung to the traditions of the ancient traditions of the Rajputs, resisting conversion to Islam and maintaining a powerful hold , but their kingdom is surrounded by Islamic rulers of both native and foreign descent making it difficult to forge close ties with other rulers. War with these neighbors is inevitable and likely the only way to legitimize the return of traditional Rajput and Hindu rule over the region, but success in prosecuting war on one front will be reliant on success in maintaining peace on others. 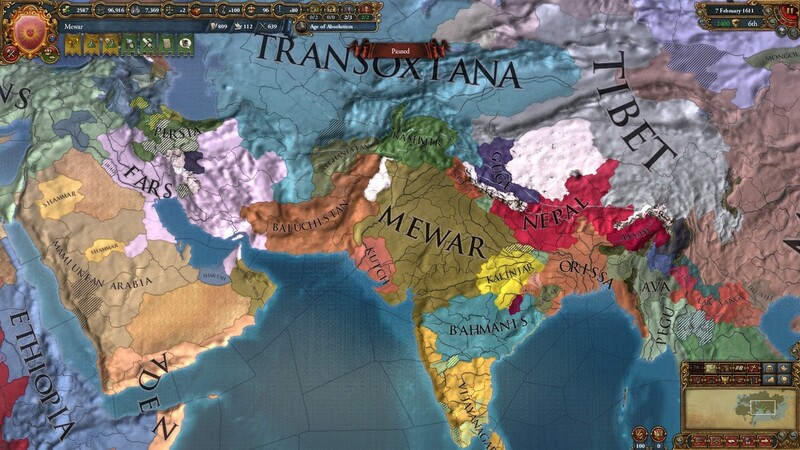 While the ferocity and tenacity of the Mewari are famed and undisputed, these diplomatic challenges and the greater relationship between the region's religions and cultures will greatly test any ambitious Mewari ruler's wisdom and ingenuity. The first great challenge has already arrived, as a close alliance with the Rathore ruler of Marwar disintegrated, pitting Maharana Kumbha against Rao Ranmal of Marwar for control of the two regions. For his arrogance, Rao Ranmal was assassinated at the order of the Maharana, but his son Roa Jodha now leads a rebellion from the Marwari deserts. To the east and south, the sultans of Malwa and Gujurat both lie in wait for any sign of weakness within the kingdom of Marwar, and are eager to expand their holdings at the expanse of the region's last remaining influential Hindu dynasty. If the threat of the Rathores is not ended quickly, and new alliances are not forged, the Rajput revival will prove a stillborn cause. To enshrine his personal victories, and the victories of the Mewari, over their many foes in recent years, including against the Rathores, the Khalji of Malwa, and the Muzaffarids of Gujurat, Maharana Kumbhakarna commissioned the Vijaya Sthambha, the Tower of Victory, to look over the city of Chittor. The beauty of the great tower quickly drew further fame to the Mewari capital and its Maharana, renowned as a defender of all Hindu people. Therefore, when the ambitious sultan of Malwa attacked Rewakantha, he must have desired war with the Mewari, for of course Kumbhakarna would answer the Hindu prince's call for assistance. This led to two years of fighting from Kalpi to Mandu, with small battles won and lost on both sides, but Maharana Kumbhakarna personally led his Rajput warriors in the war and he was victorious at every major engagement. The Mewari and Hadoti occupied the castle at Mandsaur and much of the bordering Malvi land, and it would not be return to the Malvi sultan. Weakened by years of war with the powerful Bahmani sultan, Maharana Kumbhakarna saw a magnificent opportunity for the Mewari to cripple the alliance between the sultanate of Gujurat and the kingdom of Sindh. Striking at Thatta first, whilst the Sindhi armies were fighting in far-off Khandesh, Grand Jam Tughluq was quick to secure the safety of his city with a humiliating treaty granting the kingdom of Mewar access and control of trade along the Indus River for the next decade. This left the Gujurati sultanate at the mercy of Maharana Kumbhakarna and there ruler was dethroned. The Muzaffarids were allowed to remain in power, however, as sworn vassals of the Mewari Maharana. Before coming under Mewari rule, the Muzaffarids had lost one of their most lucrative ports, Surat, to Raja Nanadeva of Baglana, and this left the port vulnerable to falling under the influence of the Bahmanis as they sought a new access point to the sea. To ensure that the trade from Surat would not enrich his rivals, Maharana Kumbhakarna instigated a war in favor of its reclamation by his vassal, Nawab Muhammad Muzaffarid. The ease with which the armies of Baglana were defeated, verified the port's vulnerability, but it would now fall under Mewari protection. When it was discovered that Rajkumar Udai had planned the assassination of his father, the chiefs of Mewar abandoned his side in favor of his brother, raising Raimal up as the next Maharana of Mewar. Udai's few followers were swiftly crushed and Udai was imprisoned. Though the loss of Kumbhakarna before his time was a great tragedy for the kingdom of Mewar, Maharana Raimal shared many of his father's talents for governance, if not his military prowess. Eager to use any given opportunity to reassert the claims of the Rathore, Jodha Rothore, appeared at the head of an army from the deserts of Marwar and seized the city of Mandore before word reached the court at Chittor. However, the internal strife from the Maharana's assassination that the rebel of Marwar had hoped for had be handily avoided, and Maharana Raimal quickly descended upon Mandore. Within a few months, the city was opened and Jodha Rothore imprisoned in the dungeons of Chittor. As the Lodi, usurpers of the throne of Delhi, continued to expand their power, the smaller Hindu Rajputs needed to be united under coherent Hindu Rajput rule, and no other Rajput power challenged that of Mewar. Though most recognized this need and submitted with little coercion, others were stubborn and blind, such as the Raja of Dhundar, and were removed from their thrones by force and replaced by those in favor of Maharan Raimal. Maharana was a visionary and wished to construct a new capital for the kingdom of Mewar from the ground up directly in the Mewari heartland. Conveniently, large silver deposits had been found in the same region and so the new mines in this location would also benefit from added infrastructure. Using much of the royal treasury, donations from the kingdom's leading merchants, and a lucrative Jain network of moneylenders and architects, the city quickly leaped from dream to reality, and Maharana Raimal formally moved the royal court to this new jewel of the kingdom. The city was an immediate success and grew rapidly, attracting the finest artisans, thinkers, and entrepreneurs. The death of Rajkumar Hammir at the seige of Jhansi less than a year before the death of his father, the Maharana, left Hammir's newborn son, Pratap, as the heir to the Mewari throne. During his formative years, the kingdom was ably governed by his grandmother who notably supported other Hindu rulers in struggles against Muslim sultanates. As Mewar's position in Rajasthan had strengthened, an alliance with the Muslim nobility of Jaunpur had become politically intolerable, and so the Maharani sent gifts of gold to the monarch of Orissa as he fought a losing war against the Jaunpuri. Similarly, Mewari mercenaries assisted the Maharana of Vijayanagar in war against the Bahmanis, and the Raja of Mewat was given protection from the expansion of Delhi in return for fealty and tribute. After initiating the offensive against the allied sultans of Malwa and Delhi, Maharani Ajab died at Udaipur, and a regency council from the Rajput nobility maintained stability until Pratap was finally old enough to rule. As the sultan of Delhi was expanding his control into the weak realm of the Sindhi sultanate, the generals of Mewar agreed that it was a favorable time to weaken the alliance between the Malvi and Delhi. With the soldiers of Delhi engaged in the Baluchistani provinces, it was easy to keep the forces of Malwa separated from any support and the sultan's palace in .... quickly fell. With the Malvi subdued, the armies of Mewar marched on Delhi and Lahore. After two crushing defeats on the battlefield, the sultan of Delhi relented and ceded some of his borderlands, including the fort of ... securing ..., the last remaining holding of the old Rajasthan realm that was still held by heathen lords. 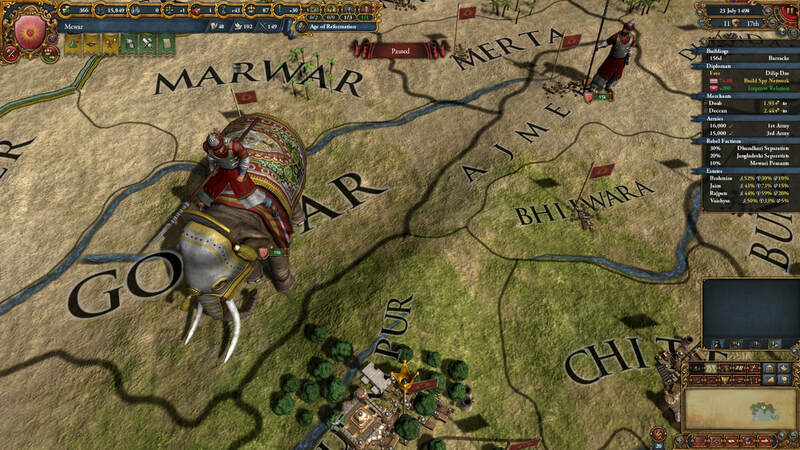 While the kingdom of Mewar enjoyed peace, several bloody wars raged between its neighboring rivals. 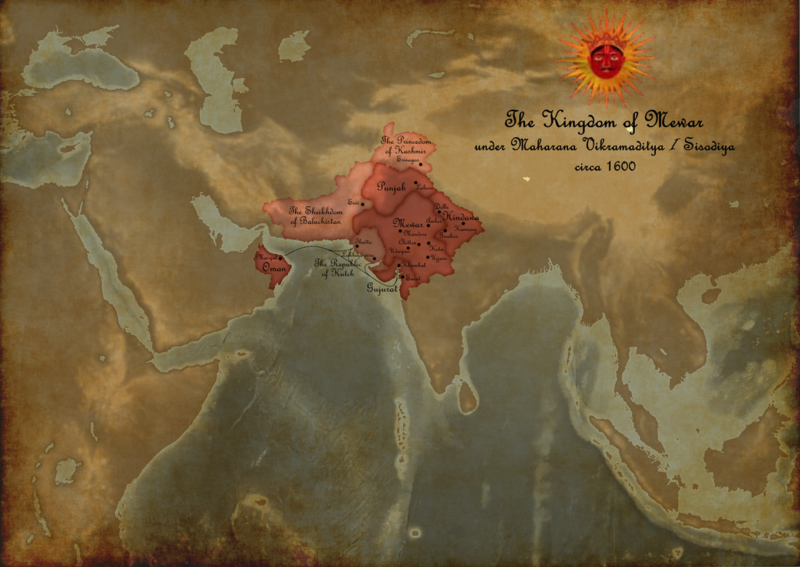 While this fighting kept these nations weak and vulnerable at the moment, the Maharana knew that the victors would eventually emerge stronger and could threaten Mewar's newfound security. With support from the Rajputs, he decided to take advantage of the situtation to further Mewar's influence, and sent his armies to invade the Khandesh region held by the Bahmanis. A quick conquest of the fort at... and subsequent use of the difficult terrain against Bahmani counter-attacks, kept Mewar's generals in firm control of the war. With their victory, most of the Khandesh region was annexed by Maharana Pratap, as well as the Muslim dominated towns of ..., as Mewar's first foothold west of the Indus River. ​Soon after the war for Khandesh, Maharana Pratap sent his soldiers against the former ally of his grandfather, the sultan of Jaunpur. Jaunpur's power had grown apace with the Mewari kingdom, each profiting from the victories of the other as they had shared many enemies and rivals, but now, as Jaunpur attacked their mutual rival in Delhi, intent on seizing the city himself, Maharana Pratap knew that the Jaunpuri could not be allowed to further strengthen their hold on the Ganges. Pratap sent his armies to occupy the lands of Kalpi, rightfully part of the territoty of Gwalior, vassal of Mewar, and also defeated the Jaunpuri army besieging Delhi. Though the sultan of Delhi must have rejoiced to see his enemies slaughter each other, it was clear that the power of Delhi was waning and the city would have surely fallen to Jaunpur had the Mewari not intervened. After further battles near Delhi and in the Marwar desert, the sultan of Jaunpur withdrew his armies from Delhi and Mewar and relinquished control of Kalpi. Though the Mewari armies triumphed repeatedly over the Jaunpuri, the war quickly drained Pratap's resources and stretched his forces precariously thin, and so the final border changes were small and did not contest any traditional Jaunpuri domains. The Raja of Palitana had maintained a strong position in Kathiawar through a friendly alliance with the Maharana Praudha Sangama of Vijayanagar. This princedom's prosperity and isolation from Muslim expansionism, however, was provided by the kingdom of Mewar and Maharana Pratap did not appreciate Palitana's lack of contribution to the greater wars against the sultanates to the north and west. When Sultan Amir of the Bahmanis targeted Palitana cities at the start of the latest eruption of violence between the Bahmanis and Vijayanagar, the Raja of Palitana withdrew from the war and his alliance with Vijayanagar in return for the mercy of Sultan Amir. Now estranged from the Vijayanager, Maharana Pratap determined that the Raja of Palitana must bow to the throne of Udaipur, and sent his generals to occupy the vulnerable coastal realm. The proud Raja was quickly dethroned and loyal Mewari lords were appointed to rule Saurashtra, solidifying Udaipur's rule over all of Kathiawar. As the kingdom of Mewar had ascended, it had often been at the expense of the kingdom of Sindh, formally a fierce rival, but now a shadow of its former strength with little actual influence in the Indus delta region. Under siege from the Imamate of Oman and the Timurid Sheikh of Fars from the west, a final invasion from Mewar ended all regional power of the Sindhi Samma dynasty. From captured territory in the Kalat mountains, Maharana Pratab granted self-rule to the local Baluchi nobility who chose Ahmad Mihrabanid as their sheikh and representative at the court of Udaipur. In return for their autonomy, however, the Maharana demanded that the Baluchi sheikh, his family, and his court all publicly purify themselves according to Vedic tradition, accept the Hindu faith, and participate in ritual Hindu worship. While the Mihrabanid and their supporters accepted this rejection of Islam, dissent over these demands among the wider Baluchi population would cause a strained relationship with the Mewari administration for the next decade. In an effort to assuage their marginalized position in the Mewari kingdom, Maharana Pratap took a Mihrabanid daughter for his second wife. When Pratap fell ill and died, Maharani Ashraf only briefly held power as regent for the young Maharana Raj but her short reign would have a lasting impact on the kingdom, due to her fascination with the ancient city of Ujjain. Having traveled to the city with her husband while he was alive, Maharani Ashraf had learned of its history as the ancestral heart of Rajputana and returned to oversee her husband's burial at this sacred site. Afterword, the widowed Maharani refused to return the royal court to Udaipur. With the support of the newly crowned Maharana Raj, son of Pratap, the Baluchi regent invested extensive resources into rejuvenating Ujjain and replanting much of the kingdom's administration in the Malwa region. With two years of royal support, Ujjain had attracted talent and investment from far and wide, first rivaling Udaipur, and then surpassing it. We war reignited between the powers of Jaunpur and Delhi, the young maharana ordered a bold attack on the allied sultans of Malwa and Jaunpur in order to prevent the Sharqi of Jaunpur from further expanding his hold over the great cities of the Ganges River. Unable to fight the soldiers of Sultan Mubarrak Shah Lodi of Delhi and the Mewari at the same time, Maharana Raj's enemies did not stand against him long, and his commanders soon occupied the Central Doab and the Malvi capital. While Jaunpur's losses were mostly in prestige and pride, Sultan Mali Rao of the Malvi lost almost all territorial power beyond the walls of his capital city, Kherla. In place of the Khalji Sultan, Maharana Raj restored rule of Ratanpur to the Raja of Jharkhand and allowed the Gondi to appoint the clan of Deogadhi to rule of the new princedom of Garha. While Raj Singh and the Sisodiya nobility did wish to extend their rule even over the Gondi lands and beyond, the Maharana's council was adamant that the administration of Ujjain could not yet look away from the people of Kathiawar and Sindh. In these regions the nobility was still adjusting to Mewari rule and were vulnerable to foreign influence and intervention, and so the Sisodiya and the Mewari Rajputs would need to content themselves with restoring Hindu rule over Gondwana. As the kingdom of Mewar came to dominate political affairs in the lands between the rivers of the Indus and Ganges, it would be drawn more often into the conflicts of India's other regions. Over the generations, a shared history of defiance in the face of the old Muslim dynastiest had developed an alliance between the Sisodiya monarchs and the Gajapati of Orissa. When Maharaja Bhanudeva III Gajapati began a campaign to secure his hold over the Bengal Delta, Maharana Raj Singh sent many regiments of Mewari soldiers to support the effort in order to limit opportunities for the sultan of Jaunpur to do the same. Among the Rajputs, Maharana Raj Singh had striven to create the sense of a holy calling for the downfall of Delhi and the restoration for Rajputana, combining centuries of martial tradition with zealous resolve. The Delhi sultanate was still formidable, but was losing control of the northern mountains to an alliance of rival Muslim monarchies in Afghanistan and Transoxiana. The first Mewari Crusade attacked on the heel of one of these northern conflicts and captured Multan and Sirhind, two of Delhi's prize cities, which were ceded to Mewari control by Sultan Sayyid Khidr Lodi as the Mewari armies stood at Delhi's gates. 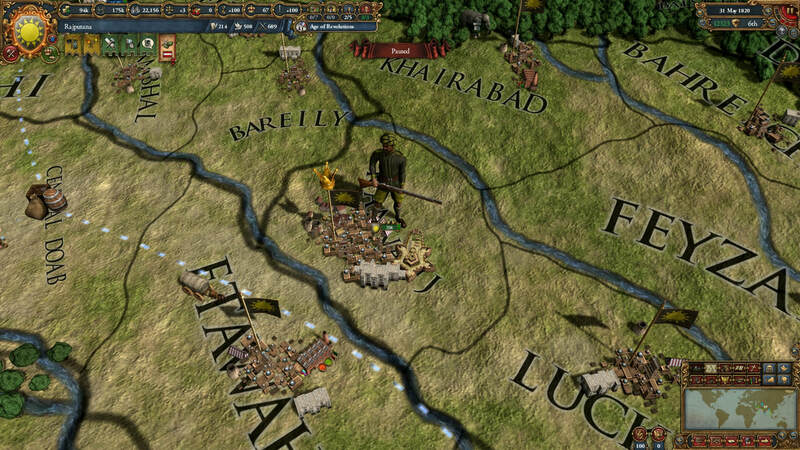 Delhi's collapsing control over the western Ganges allowed a small sect of Shia nobility to break away from their Sunni overlords, and establish the rival sultanate of Oudh. This Shia sultanate found itself immediately threatened by the Sharqi of Jaunpur, but Maharana Raj Singh decided to become involved in the conflict in order to maintain the fractured status of the northern Muslim dynasties. Defended by the powerful armies of Mewar, the sultan of Oudh was not only able to defend his small realm, but also annex the venerable city of Kannauj and its fertile surroundings at the expense of their enemies. Many generations ago, the Lodi dynasty had split into the house of Delhi and the house of Punjab, two monarchies that had alternatively worked against each other and in cooperation. Mewar's peace treaty with the sultan of Delhi did not protect the Lodi of Punjab, and so the armies of Mewar moved against this faction as soon as they had secured control over Multan and Sirhind. Recognizing that the decline of the Sisodiya dynasty was far from likely, the monarch of Punjab accepted a generous offer to rule Lahore and Sind Sagar as a newab sworn to the Sisodiya throne in Ujjain. Raj Singh's son, Udai Singh, turned the kingdom's attention west of the Kalat mountains for the first time. The Mihrabanid sheikdom, with their holdings in the Kalat mountains, was not a rich realm, but had become an important member of the Mewari court due to their important role in the defense of the Indus valley. They had proven their worth and loyalty in the many conflicts during the reign of the Maharana's father, and Udai saw that the Baluchi also provided an opportunity to extend Hindu rule past its traditional frontiers. In the past decades, the Baluchi tribes had been dominated by first the sultanate of Sindh, and then by the Shiekhdom of Fars and the Imamate of Oman after the conquest of the Sindh heartlands had been completed by Udai's grandfather, Maharan Pratap Singh. Leveraging their ancestral claims over the region, the soldiers of Mewar invaded the poorly defended frontiers of the Omani and Farsi. Udai's commanders had overestimated the strength of the enemy and met little of the expected resistance as they occupied the towns along the coast up to the Straits of Hormuz. In fact, far more fighting took place at sea where the fledgling Mewari fleet conducted its first major naval offensive. While the kingdom had conscripted the seamen of Gujurat and Kutch into the service of Mewar for the past century, naval warfare had never been given any attention in the planning of Mewari commanders and been avoided almost entirely, but more recently the ports of Gujurat had become integral to the income of the Mewari kingdom and an increased reliance on access to the sea had expanded the ambitions of Maharan Udai Singh beyond the traditional ideas of the Sisodiya monarchs. The Mewari fleet, composed of Gujurati ships and supported by the fleet of the Kutchi Republic defeated the Omani and Farsi alliance at sea, and allowed the Mewari army to cross the Straits of Hormuz and occupy the Omani heartland. There, at the Omani imamate's capital of Nizwa, Maharana Udai demanded that the Muslim rulers withdraw entirely from Makran, hand over the castle at Bam to the Mihrabanid sheikdom, and cede the port of Muscat to Mewari rule, extending the reach of the Sisodiya across the Arabian sea for the first time. War in the Bengali regions once again saw the soldiers of Mewar fighting at the side of the Oriya. 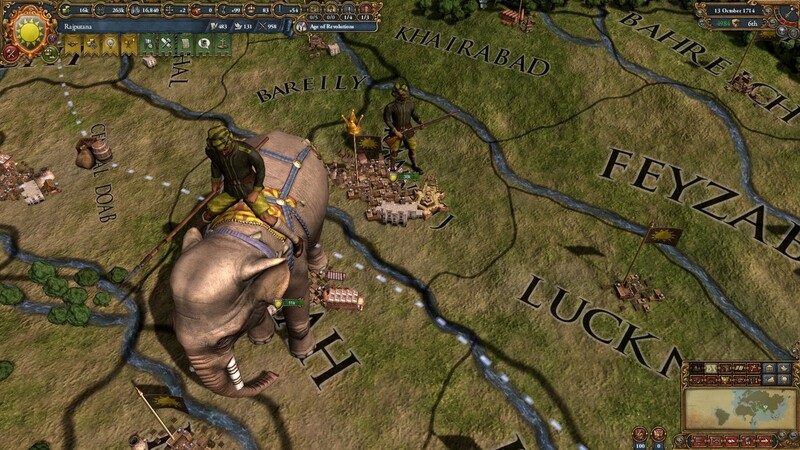 Though the first year of the war so a discoordination between the two allies that led to a series of defeats in the Gaur borderlands, an offensive on Jaunpur soon removed the sultan from the conflict and bring the war to and end in favor of the Maharaja of Orissa. In the culmination of a dream that started with the great Kumbhakarna Sisodiya, Maharana Udai Singh was poised to end the legacy of the Delhi sultans. The Lodi of Delhi had never recovered from the wars of Maharana Raj Singh's reign, and no longer ruled much outside the land of Upper Doab, but taking the city of Delhi was still the top priority of the Hindu Rajputs of Mewar. In an utterly one-sided war, Maharana Udai Singh invaded Upper Doab and quickly took Delhi, while Sultan Sayyid Khidr Lodi fled his city to rule in exile across the Ganges in Sambhal. The Hindu zealots sacked the great city, causing devastation that would haunt the city for the foreseeable future and bringing back much of its monuments and treasures to Ujjain to symbolize the rise of the Rajputs over those who had long subjugated the lands of India. While the sultanates of Oudh and Jaunpur still fought over the Ganges between Delhi and Jharkhand, and the powerful Bahmanis still reigned over the Deccan plateau, Muslim rule in India was steadily and indisputably withering away. 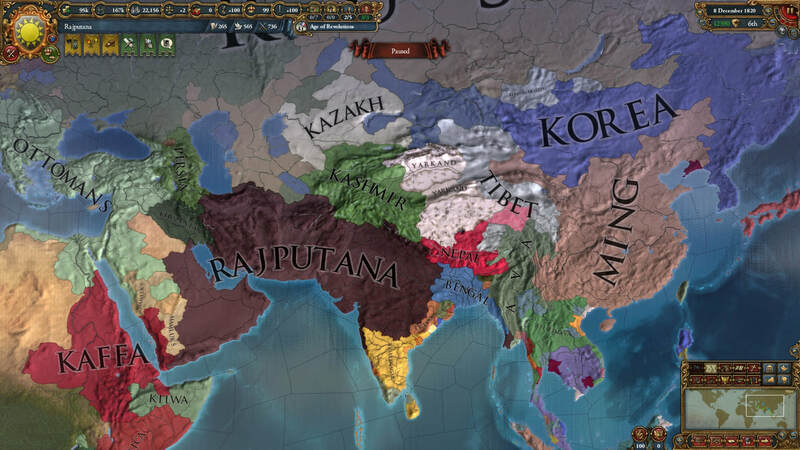 The chaos of Delhi's demise allowed gave many marginalized powers opportunity to extend their control into the Ganges plains, one such power being the Himalayan kingdom of Sirmur. This led to conflict between the Maharaja of Sirmur and the Lodi of Punjab, who also claimed this land, and naturally the Maharana Udai Singh favored the claim of his vassal. After a year of pursuing a diplomatic solution that would bring the contested land back under the Lodi, the frustrated Maharana sent Mewari troops to occupy the province and defeat the Jaunpuri troops that propped up Sirmur authority in then area. Once considered a distant region with little impact on the kingdom of Mewar, the affairs of Persia and Arabia were now discussed frequently in the courts of Ujjain. The closest of these realms were weak and fractured, but farther west were the powerful sultanates of the Ottomans and the Mamluks. Maharana Vikramaditya decided to cement Mewar's foothold in this region by completing the conquest of the collapsed Omani Imamate, and investing great effort and resources into bringing the Omani into Rajput society. Despite one major rebellion of zealous followers of the deposed Imam, the larger Omani population quickly saw the benefits and stability brought by Rajput rule and embraced their privileged role as Mewar's gateway into Arabia. Maharana Vikramaditya believed that the first priority of the monarch must be to preserve the works of those who came before him. In order to protect the vulnerable lands of the Ganges that had been secured by his father and grandfather, and to prevent Muslim conquerers from ever descending onto the plains of the sacred river again, Vikramaditya wanted to construct great fortresses that could guard the passes of the great mountain north of Punjab. However, since this land was still held by the Muslim sultan of Afghanistan, the first step of the Maharana's plan was an offensive into the mountains. While the initial attack into Kashmir and Kabulistan was straightforward, the terrain slowed the progress of the armies, and a counterattack by the sultan's Farsi allies saw the conflict extend all along the Baluchi and Omani provinces of the western borderlands. At the negotiations of the Afghani sultan's capitulation, where the liberation of the Princedom of Kashmir was realized, Vikramaditya struggled not to show his relief regarding the war's end. Intent on recovering land lost to the Bahmanis in decades past, the Maharaja of Orissa called Vikramaditya to arms against their mutual rival. While the war looked favorable at its onset, the multiple Bengali revolts kept the armies of Orissa engaged far in the north and allowed the Bahmanis to recover from their initial losses and advance on Cuttack. Seeing that nothing significant was to be gained from this prolonged conflict, Maharana Vikramaditya agreed to withdraw from Bahmani lands in exchange for the bordering lands of Baglana. Many months later, his ally in Cuttack came to a less favorable peace agreement, unable to regain the lost Orissan territories and losing further southern holdings. The princedom of Gwalior had grown powerful under the protection of Mewar and its princes had served as the Sisodiya's steward of the diverse cities and populations of the eastern Ganges as the Mewari maharanas were slowly able to extend their influence into the region. However, more recently, the administration of Ujjain had removed much of the princedom's autonomy as this fertile and productive region transitioned from becoming a fortified frontier to a major economic and cultural center of the kingdom. North of Gwalior, the Hindu raja of Oudh, who had overthrown the previous Muslim monarchs of the small realm, may have been deterred from peaceably submitting to the Sisodiya, knowing that Gwalior's fate would most likely also come to his own dynasty. However due to his unreasonable attachment to independence, his dynasty's rule came to a far more abrupt end as he was deposed by Maharana Vikramaditya's soldiers, and more sympathetic nobles were given a more limited rule of Oudh in the name of Mewar. With the city of Kannauj and most of Oudh brought under the control of Mewar and the Sisodiya, Mewari nationalism quickly manifested an expectation of hegemony over all the lands of the Ganges, with the possible exception of the kingdom of Orissa in the Bengal Delta. This expectation grew dramatically with the passing of Maharana Vikramaditya, and under his son popular pressure soon led to conflict with the monarchies of Kalinjar and Nepal, each refusing to relinquish lands they had seized from the waning power of Jaunpur. The Maharaja of Orissa continued to support Mewari expansion, and sent his armies to fight the Nepalese while the armies of Maharana Jay Singh methodically occupied the Nepalese forts of the Himalayan foothills and the Gondi forests of the Kalinjari. The resultant treaties saw Allahabad and Bahreich ceded to the Mewari nobility, and the reemergence of the Raksel princedom and the kingdom of Jumla, small realms eager for independence from the rule of Kalinjar and Nepal respectively. After the divisive wars over the Indian heartlands, Maharana Jay Singh made an effort to pry public enmity away from the Hindu neighbors of Mewar and refocus his people's zeal against the distant powers of Persia. Ever since the Mewari conquest of Oman, Mogostan and the straits of Hormuz had been desired by the Rajput trade guilds, providing strong financial incentives to put behind the Maharana's plans for a westward crusade. As Hindu armies crossed into the Farsi Shahdom, the armies of Fars and their allies offered an elusive defense that struck where the Mewari were weakest before retreating into the mountains and deserts, but this strategy was unable to retake their forts or defend the Shah's seat at Shiraz. When the weakened state of the Shah prompted the peasants to rebel around Shiraz and converge on the city, the two sides reached an agreement that left the straits in control of Ujjain. Maharana Udai Singh's policies benevolence toward the Hindu kingdoms of India could not maintain peace along the eastern borders of Mewar, however. The Sangama dynasty of the powerful realm of Vijayanagar, once allies of the Sisodiya, did not appreciate growing Mewari influence over trade in India, and Udai Singh's vigorous development of the Gujurati and Kutchi coastlines had resulted in a shift in fortunes for many southern merchants and the Vijayanagari treasury. When Maharani Anitalli of Vijayanagar imposed a strict embargo on all trade with Mewar, Udai Singh decided to strike first rather than ignore the escalating situation. In a show of power, he ordered his commanders to forcefully open the borders at Thana and occupy the ports of the Deccan coastline. The armies of Mewar were famed and seldomly defeated even when outnumbered, and the defenders of Vijayanagar were swept aside after a few months of intense violence in the southern jungles, and the new Mewari fleets performed surprisingly well against the veteran admirals of Vijayanagar and succeeding in blockading much of the southern ports. 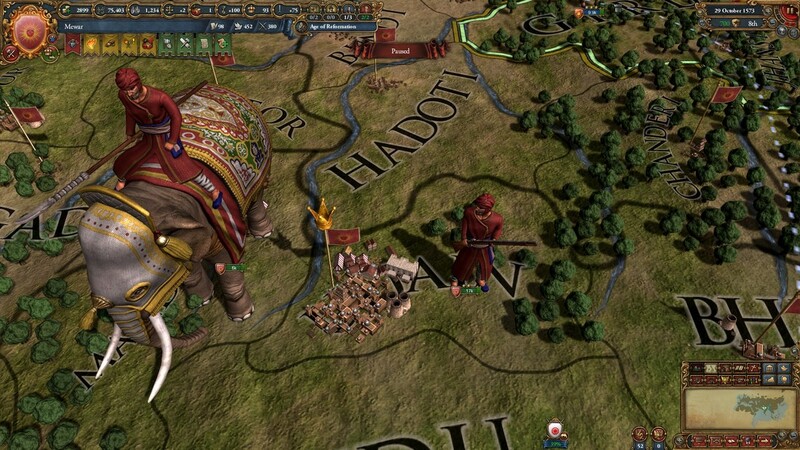 With Mewari soldiers marching into the Victory City itself, the Maharani was forced to accept her humiliating defeat, and negotiate new and generous trade terms with Udai Singh. The Sultan of Jaunpur controlled little beyond the walls of his prestigious city, but still held ties abroad with Muslim would-be conquerors, namely the Timurid Sultan, Ali II. Rather than allow such plotting to take advantage of any future weakness that his kingdom might suffer, Maharana Udai Singh roused support to capture Jaunpur and dethrone its sultan once and for all. Unsupported and surrounded, the city yet withstood the Maharana's siege for a year, while Mewari commanders moved through Kashmir and Baluchistan into Timurid territory to confront Sultan Ali. The ambitious Ali was unprepared for an invasion of his realm, and within another year had lost Samarkand to the Mewari, and agreed to abandon designs on India as well as much of his territory bordering Kashmir. The zeal of the crusade quickly carried over into war with the Bahmani sultan, where public support was thrown behind Orissan claims over the jungle hills of Garjat. The Bahmani armies, mostly Hindu themselves, fought fiercely for their Muslim monarch, and the war was bloody and taxing for all involved, but the cunning Bahmani commanders could not defeat the numbers allied against them. The war would result in Bidar loosing all influence over the Andhra coast and the majority of Garjat. As the reach of Sisodiya influence extended west, ambitions regarding the markets into Persia naturally followed. During the reign of the first Udai Singh, the Afghan sultanate had held significant power in the region, but had lost their hold over Kashmir to his son Maharana Vikramaditya and its strength had diminished steadily since. Kabul, a linchpin for trade with Persia, was now precariously situated between the armies of the Sisodiya and the Timurids, and the second Udai Singh decided that it should be held in Hindu hands. The Timurid sultan disagreed and sent his soldiers to defend the city, but were defeated in multiple battles among the Afghan mountains. The small emirate of Sharjah, notorious for harboring pirates that frequently attacked Mewari trading ships, also took the opportunity to attack the Princedom of Haasa in the name of the Afghans, but this short-lived assault allowed Raja Muhammad II, vassal of Mewar, to justly occupy and annex the ports of the Pirate Coast in order to protect shipping in the Persian Gulf. With a secure hold over the ... regions of the central Ganges, Udai Singh II invested monumental resources in restoring and glorifying this ancient city due to its historic role as the capital of the last great Rajput empire and its place in the heart of Indian culture. Over the past centuries, the Sisodiya had cunningly defied the odds and the annals of history now listed a string of rivals that had been defeated and eclipsed by the kingdom of Mewar: Marwar, Malwa, Gujurat, Delhi, Jaunpur, and the Bahmanis. This long list solidified Sisodiya as unparalleled defenders of the Hindu and had extended Indian influence to lands that had never before seen Hindu rule. The other great Hindu kingdoms of Orissa and Vijayanagar lived in the shadow of Mewar and have proven unable to contest Mewari strength. Udai Singh, proud of the accomplishments of his people and proclaiming that his kingdom had transcended its roots, moved his court far away from the Mewari heartlands to Kannauj, declared the restoration of the Empire of Rajputana, and assumed the title of Chhatrapati of the Rajputs. While the move to Kannauj was controversial for both economic and cultural reasons, Udai Singh recognized that the Sisodiya now controlled a diverse realm that required a new and unifying ethos. While the Mewari and the Rajputs were still the heart of this new empire, the Sisodiya would need to bind the Malvi, Andhvi, H.., Marathi, Punjabi, Gujurati, Baluchi, and Omani to their cause and a new shared beginning would bring this about, and propel Rajput ambitions ever forward. Conflict with the Bahmani sultan, the last sultan of India, erupted again over the Garjat borderlands between the sultan's realm and the kingdom of Orissa. The Maharaja of Vijayanagar, resistant to the growing power of the Orissan-Rajput alliance, upturned centuries of political animosity and fought alongside the Bahmani sultan against the Orissan attack. However, the Sisodiya still supported the downfall of the Bahmanis and Rajput armies steadily captured both Bahmani and Vijayanagari fortifications heading south for its Marathi provinces, while further armies helped retake Cuttack and other cities lost by the Oriya Maharaja after initial defeats at the outbreak of the war. After two years of fighting, Oriya succeeded in capturing the remainder of Garjat as well as Vijayanagari ports along the southern coast in recompense for their involvement. Chhatrapati Jagat Singh ascended to the new throne of Rajputana only a few years after its momentous creation, and the young monarch was watched intently to see what direction he would take the Empire. The Chhatrapati was immediately called to war against the Buddhist armies of an eastern alliance formed to fight the kingdom of Orissa, and saw the Rajput armies excel on the battlefield even in the rugged lands of the eastern mountain ranges. While this allowed his people to laudably extend Hindu control over these new frontiers, he also saw the great sacrifices his soldiers made to compensate for the poor planning of the Oriya commanders and quickly grew begrudge the degree to which the Maharaja of Orissa had relied on his father and Rajput support to maintain his authority. After the war, Chhatrapati Jagat Singh chose to peacefully pull away from this traditional alliance cutting many ties to the court at Cuttack, and allow the protection of the Bengali Hindus to rest solely on the Maharaja of Orissa. Wisely, the young Chhatrapati's concerns focused on more distant targets compared to his predecessors, and the affairs of Istanbul, Moscow, and Beijing generally consumed the dialogue of the court at Khannouj instead of more local issues. The ambitions of the Ottomans, in particular, were known to conflict with the Chhatrapati's plans to extend Rajput influence over all of the rich Persian highlands and into Mesopotamia. For this reason, the Rajput armies were given little rest before being sent west to fight the Farsi that continued to dominate the region, and their Arabian allies. Having lost Qahirah and the Nile Delta, the sultanate was in dire need of support against the expanding Ottoman empire and the exiled Mamluk court supported the expansion of Hindu control in the region, eagerly attacked the Yemeni, who were also allies of the Ottomans. The break between the Sisodiya and the the Suryavansha of Orissa did not develop into enmity and Rajput troops would still frequently be rented to serve the Suryavansha in their wars, but appeared in much fewer numbers than before. However, the two dynasties found cause to work together in full once again when Chhatrapati Jagat Singh decided to demand his rightful hegemony over Gondwana be recognized by the Raja of Kalinjar and his meddling allies. Hindu armies clashed in many battles, along the borders of the countries and Kalinjar's alliance was soundly defeated. Though Rajput control over Gondwana now appeared uncontested, the unique status of the Gondi people and their rugged land was recognized with autonomous rule by Gondi nobility in vassalage to Kannauj. The first war of Pratap Singh's reign was a true test of the Rajput martial heritage that would quickly erase any overconfidence the young ruler harbored in strength of his empire. The policies Udai Singh II had entangled Kannauj in the affairs of the powerful Ottomans in an attempt to curb their seemingly limitless ambitions, but it was not until the reign of his grandson that the people of Rajputana would have to pay the price for these projections of power. When the Ottoman armies sought to wipe out Mamluk holdings in Arabia, granting them to the Shammari instead, Rajput armies honored their alliance with the Mamluk sultanate in order to fight what was considered a far greater evil. The Arabian sands played host to the largest battles Rajput commanders had even seen and Rajput armies saw both glorious victory and bitter defeat in equal measure. After years of fighting, Chhatrapati Pratap Singh considered it a victory when the Ottoman commanders withdrew from Arabia, and the Shammari and Mamluk nobles agreed to end the war with no demands. With a foreign policy aimed at preventing the expansion of Ottoman influence further east, allies of the Ottomans were also targeted. As the distant Empire of the Ethiopians began to be targeted by these allies, the Chhatrapati offered to intervene against their Yemeni aggressors. Unable to confront the disciplined armies of Rajputana without the support of the Ottomans, the Yemeni were quickly brought to the negotiating table and the Ethiopians regained much of their lost lands. Despite claims to the region by two rival Persian dynasties and the Timurid sultanate of Samarkand, Rajput control over Persia had steadily strengthened over the course of two centuries through both violent war and peaceful policies promoting the acceptance of the region's peoples into Rajput society. In contrast, the Timurids had been steadily loosing ground to Rajput and Russian expansion and seemed locked in an inevitable decline, and Chhatrapati Pratap Singh saw this to be of great benefit to his people. Seizing on their precarious position, the Chhatrapati called for the occupation and annexation of the Sistani trade routes that controlled travel north of the ... mountains. The diminished forces of Samarkand could do little to protect their cities from the great Rajput armies and were forced to fight from the wilderness of the steppe and the deserts until their sultan submitted to Pratap Singh's demands. Returning to matters of the Rajput heartlands, Chhatrapati Pratap Singh decided to depose the Raja of Kalinjar due to continued scheming and defiance against Sisodiya rule in Gondwana. The Raja called on the kingdom of Vijayanagar to protect their independence, but even their interest in thwarting the Chhatrapati's designs soon waned once again after a series of defeats on the battlefield. The royal famly of Kalinjar was imprisoned and their lands integrated into Rajputana. Between the realms of Garha, Vijayanagar, Orissa, and the Bahmanis, a Golkondan warlord had declared himself as Raja in a power vacuum left by the fall of Kalinjar. This small realm was quickly set upon by the Bahmani sultan, whose dynasty had once controlled these lands a century ago, but Chhatrapati Pratap Singh chose to send the Rajput armies to defend the Golkondans from Bahmani aggression. The Bahmani dynasty, much diminished from the fearsome reputation of its past, was quickly overwhelmed, losing all control of its northern borderlands. In gratitude and recognition of their dangerous position, the Golkondan nobility accepted a position of vassalage to Kannauj. A few years before his death, Chhatrapati Pratap Singh had disinherited and exiled his only son, Rajkumar Kumbha, in a controversial and public display. While Pratap Singh, widely seen to have been in the prime of a successful and secure reign, must surely have had plans to safeguard Sisodiya rule, he unexpectedly died of an acute illness shortly afterward. While more distant members of patrilineal descent existed, none was as influential or popular as Jodha Vaghela, a son of a daughter of Maharana Jay Singh, and distant cousin of the late Chhatrapati. Moving swiftly, the Vaghela were able to gain the support of the Rajputs and the Brahmins with little resistance, as no concerted opposition emerged until long after Jodha had secured his position in Kannauj. This belated opposition would haunt Jodha legitimacy for a time, but never materialized into a direct challenge. Determined to show that his rule would follow in the footsteps of his popular predecessor and to direct attention to foes outside the borders of Rajputana, Chhatrapati Jodha followed widespread enmity towards the Timurids and led an attack aimed at conquering the city of Herat. While strong opponents such as the Ottoman or Russian Empires may have tested Rajput resolve on the battlefield and Jodha's control over his administration, the Timurids offered a straight-forward victory for the first Vaghela ruler of Rajputana that helped to cement popular support for his rule. The Sultanate of Transoxiana had proven unable to coexist with its neighbors, both north and south, and had been stripped of its final grip on power in the region by an invasion from the Russian Emperor. The downfall of the Timurids left many lawless regions between the lands claimed by the Russians and the borders of Rajputana, and Chhatrapati Chandrasena invested his military and administrative resources into subduing these borderlands and returning the security of law to their Muslim inhabitants. While the authority of the Bahmanis had been reduced to the city of Bidar and its surrounding hinterlands decades ago, the Muslim sultan had so far kept his head by taking advantage of rivalries between the surrounding Hindu monarchies. Though the act of aggression would provoke a longer war with the Maharaja of Vijayanagar, Chhatrapati Chandrasena Vaghela removed this final vestige of Muslim rule from India by assaulting the walls of Bidar and hoisting the Rajput flags upon them. For supporting the Bahmanis, the Chhatrapati's armies humiliated those of Vijayanagar and forced them to retreat from their recent expansion into Telinga. 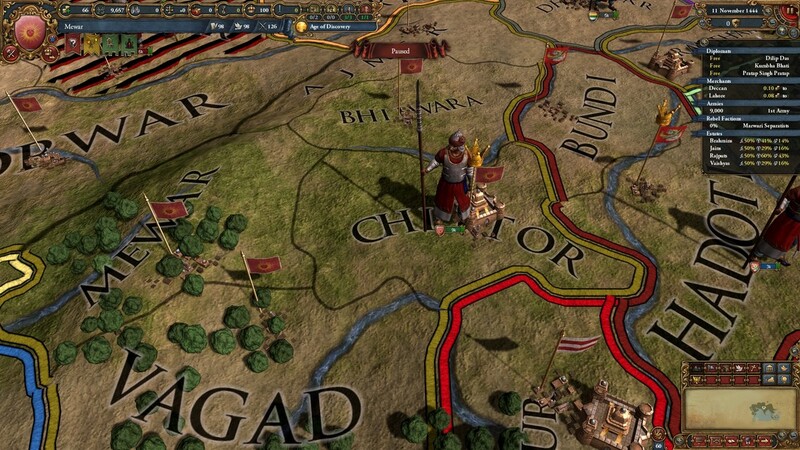 Before a Vaghela had risen to the Rajput throne, the Sisodiya had long desired to control the trade routes of Samarkand, and now that the Timurids had fallen, the Russians occupied the famous city. Chhatrapati Chandrasena knew that his dynasties place in history would be cemented should he capture it for Rajputana. While a war between the Russian and Ottoman Empires drew most of their defenders to lands far to the west, Chandrasena sent his armies to quickly overwhelm Samarkand's Russian defenders while further forces invaded their Persian allies, descending on Tabriz. 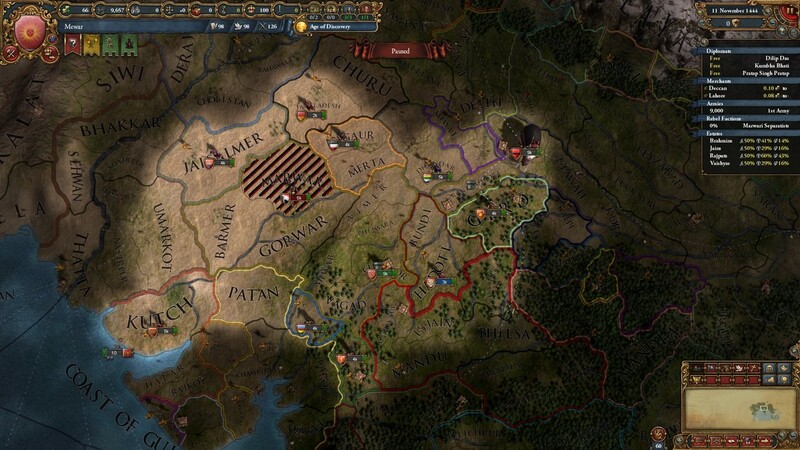 The war would last many years, outlasting Chandrasena himself, and while the Russians proved formidable opponents for the armies of the Ming and Mamluks, the soldiers of Rajputana were victorious in every major battle and drove the enemy all the way to the city of St. Petersburg. Occupied and controlled for the entire war by the by the Rajputs, Samarkand was officially annexed by a treaty with the Russians signed by the Chhatrapati's widow, Songari Bargujar. The death of Chhatrapati Chandrasena's only child at a young age had left his late brother's son, Udai Singh, as the chosen heir to the throne of Kannauj, but he was still a child at the time of Chandrasena's own passing. Chandrasena's second wife, childless herself, held the regency and guardianship for Udai Singh until his formal education was complete, helped bring the wars with Russia and Persia to an orderly end, and began integrating the Persian nobility into Rajput society and Hindu traditions. 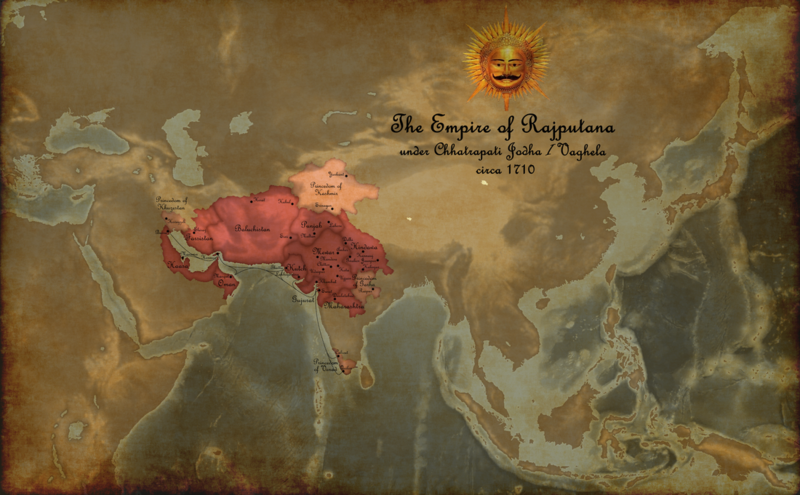 Her initiative was instrumental in maintaining peace in conquered Persian lands and ensuring the resources of these provinces were efficiently utilized for the benefit of all Rajputana. In the search for partners willing to stand against the Ottoman Empire, the favor of Kannouj had drifted from the Mamluks to one of their adversaries, the kingdom of Kaffa, due to growing displeasure with the political ambitions of Cairo's sultan. When Cairo fell to the Ottoman armies once again, all hope of a resurgent Mamluk realm to contest Ottoman hegemony was abandoned. In order to redirect trade resources that would soon be seized by the Ottomans toward the Rajput trade centers of Hormuz, the young Chhatrapati was advised to send his armies to capture Adan and did so. The defunct Mamluk government was unable to prevent the move, and the Yemeni coast came into Hindu hands. While there had been a European presences in the city of Goa and other cites that had been purchased from monarchs in India, a sudden series of attacks led to a surprisingly aggressive capture of land along the western coast of India by multiple European powers. 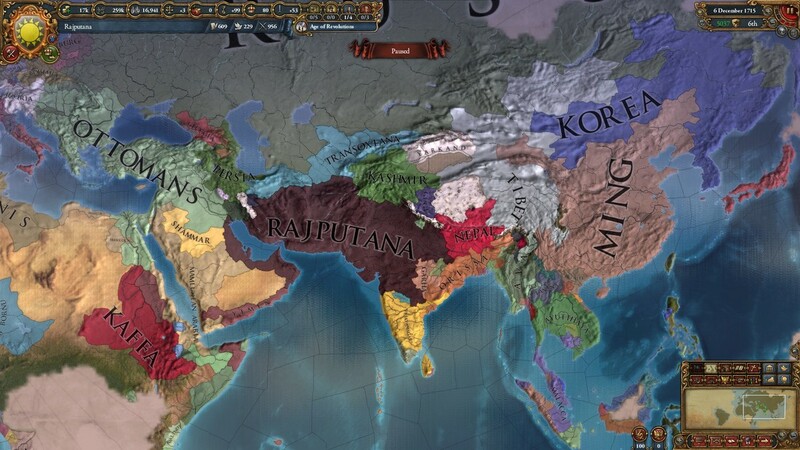 This new encroachment on Hindu realms by the Christians of Europe, was a novel issue for the leaders of Rajputana, and there was much dispute on what should be done about the Hindu kingdoms that were proving unable to defend themselves. Intent on preventing further subjugation of Hindu lands, the Chhatrapati commited his forces to the defense of Orissa, and the Rajput commanders were able to rout the French expeditionary forces in two major battles. After there initial foothold in Orissa was dislodged, the allied Indian realms occupied all the ports of Telangana, which had been controlled by the French for the past six years after a successful invasion of the kingdom of Vijayanagar. The French were unable to land further armies in India and their navy suffered several defeat by the combined fleets of Orissa and Rajputana. The Maharaja of Orissa eventually accepted peace terms that allowed the French to return to some of their southern ports in return for ceding northern provinces to the kingdom of Orissa. ​Perceived instability in the Ottoman Empire prompted the Rajput council to push forward plans to expand the borders of the Khuzestan Princedom over all of Mesopotamia. With Baghdad as their initial target, Chhatrapati Udai Singh approved the invasion. The conflict between the two empires was costly in human life for both sides, but Udai Singh maintained a strong support for the war effort among Rajputana's many factions, and this was made easier by a continuing string of victories during the offensive. When the Ottoman emperor relented to Udai Singh's demands, the realm of Khuzestan was expanded well north of Baghdad, encompassing almost all of the Tigris and Euphrates river valleys. Now comfortable with his role as the shield of India, Udai Singh confidently intervened when a French and British alliance chose to work in coordination to expand their Indian holdings. Despite the overwhelming strength of the combined European fleets, superior coordination allowed the Chhatrapati's admiral to win a number of strategically important battles along the Indian coastlines, while the Rajput armies aggressively pursued any European armies present on the continent. Unable to consolidate a significant spearhead for their invasion, the European's eventually accepted defeat and the loss of almost all of their India conquests. Only the southern provinces of Sri Lanka, still held by the French, the city of Goa, peacefully held by the Frisians for close to two centuries, and the British ports at Midnapore and Satgaon remained in European hands. Concern that the weakening monarchy of Nepal would lead to further Ming influence in India brought forth a plan that would bring the strategically and economically vital region of the Bengal Delta under the auspices of Kannauj. Chhatrapati decided to send his armies against Nepal, in support of a well-known Hindu claimant to the crown of Bengal, one that could be assured to have Rajputana's best interests at heart. The mountain realm was forced to abandon their prosperous lowland provinces, and allow the Bengali to establish an independent Princedom in vassalage to Kannauj. In a show of promised strength in the mold of his father, Chhatrapati Ratan Singh chose to occupy the British holdings at Satgaon and Midnapore, but was surprised to see a strong response from the formal allies of the British king. The British were unable to mount any significant resistance in Bengal, but major invasions of Arabia and Khuzestan were attempted by coordinated British, German, and Italian commanders, hoping to leverage their alliance to gain footholds in these regions. While this catapulted the costs of the new monarch's planned exploits, the war provided the Rajput military with valuable experience against their modern European rivals and cemented the hegemony of Rajputana over their Iranian and Arabian holdings. ​After peacefully succeeding the short rule of his elder brother, Chhatrapati Sangha decided to extend the reach of Rajputana's merchants toward the sources of the eastern spice trade at the expense of their Ottoman rivals. Having conquered the Rakhine coastline from weak local kingdoms, the Ottoman Empire held ports that were not easily in reach of the Chhatrapati's soldiers now that Kannauj controlled the roads and ports of Bengal. 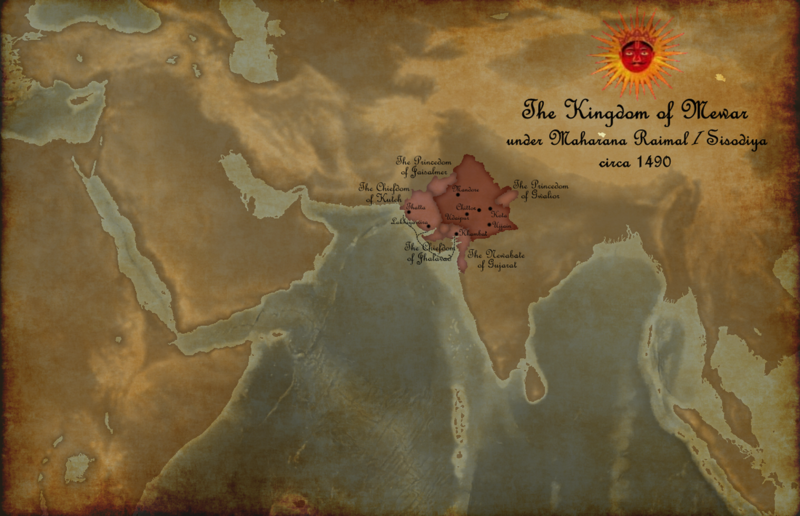 Annexing the lands of Rakhine proved simple, but this reignited fighting far in the west in Khuzestan and Arabia. The Rajput commanders, veterans of warfare in the arid conditions of Mesopotamia and Arabia, steadily pushed back the Ottoman assault and seized the Levantine and Egyptian provinces of the enemy following their initial victories. Unable to rally strong support for their colonial ambitions in the Far East, the Ottoman emperor ended the war by ceding the Rakhine to Chhatrapati Sangha and assenting to the further expansion of Khuzestan into northern Mesopotamia. While mitigating the threat of the expanding power of Moscow was always on the agenda of the Chhatrapati's court, there had been peace for decades between the two empires as the importance of the overland routes of central Asia had waned in favor of sea trade, sapping most popular support for initiating war over the disputed borderlands of Transoxiana. However, the Persian frontiers had only increased in value and importance, while the continued existence of a Mulsim Persian monarchy in Sari, supported and defended by Moscow, was a continual challenge to the rule of the Vaghela over these valuable lands. When the war between Beijing and Moscow erupted, it was viewed as a good opportunity to push Vaghela hegemony in the west through a show of force, and Chhatrapati Sangha sent the Rajput armies in force to occupy the Muslim strongholds at Sari and Tabriz, and invade their northern allies. The war required an extensive campaign into the lands of western Russia, but cemented the place of the Persian people within the empire of Rajputana by annexing Sari and the Caspian coastline and relegating Muslim control to a few major cities around Tabriz.